With more than 300 million active users, Facebook has become a hot spot of social activity. On any given day, you can find your best friend from eighth grade, post your frustrations with that certain cable company, and join the mafia or a farmer's association. 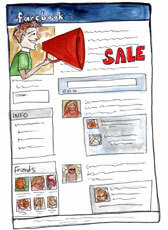 Some Facebook users use the site for business as well, by posting their eBay auction links. However, the lines between personal and business can quickly blur on the site, diluting the strength of your marketing message. There is a powerful solution to fix this clarity issue: the Facebook Fan page. But why Facebook? Besides the quick growth, the volume of users and the chance to reach an international market (more than 70 percent of Facebook users are outside the U.S.), there are other reasons, too. Hopefully, as you go through this two-part series, you will see that Facebook has many profitable utilities to use in your business. The site has the ability to target your specific customers, and most important, your customers are on this site with the fastest growing demographic being people over 35. Now some of you reading this may already have fan pages, and we'll be sharing some techniques and applications to help you build a powerful site. For the rest of you, what are you waiting for? Let's get your marketing on track to be focused, have your products in front of your ideal customers and utilize the search engine optimization for sites like Google! Profile page: This is the type of account most Facebook users have. It's a personal account and can be used for business, kid's pictures and playing mafia wars. You have the ability to add profile applications that can show your Twitter feeds, eBay inventory and more. Groups: You can create up to 200 groups on your Facebook account. This would allow you to congregate people into a community of similar interests. You can create a private or open group. Fan page: More than 10 million people sign up to join "Fan pages" every day. This option becomes like a powerful Web site, with branding, videos, blog entries and much more. If you are an organization, a brand, a "personality," a band or a business, then a Facebook Fan page is exactly what you need. Fan pages are also a lot more flexible than Groups. First and foremost: focus. I have to say this is my pet peeve about Facebook pages. Since they are becoming the hot thing, everyone who hears about them thinks they have to have one. This is a myth. Unless you can clearly articulate a reason for having one—and a marketing plan to back it up—don't waste your time (or mine, as a potential buyer) doing one more social networking site. I get up to 10 requests daily from people to sign up for a new fan page they opened. Yet they don't take the time to create any relevant content of substance. They also rarely update them, so what's the point? I still haven't articulated why I would need a fan page for the OSI Rock Stars, although I can come up with some reasons, the complete idea isn't there. However, as soon as I started my other business, Mermaid Caramels, it was incredibly easy to come up with the focus and marketing plan for a fan page. You can check it out at www.ILoveCaramels.com. (You'll learn why I use that URL in Part 2 of this article). Who you are attracting: Who are your core/ideal customers? If you have already completed your Road Map to Success, or business plan, this should be a very easy part to articulate. Goal: What is your purpose for having another page on the Internet to talk about your business? Are you going to sell things? Attract your community? Get sign-ups for your newsletter? Engagement: The days when Web pages simply provided information are gone. Your buyers are looking to be entertained, engaged and allowed to participate in an experience. How are you going to do this? With blog content? Pictures? Videos? RSS Feeds? Promotions: Do you have a plan (and the time) to run promotions? Could you put on contests? Perhaps "hide" something and engage your readers to find it? Provide prizes for customer submitted photos/videos? Uniqueness: What about your page will make people want to give you any of their valuable time each day? Could you share special offers? Exclusive discounts? Announcements of new products before anyplace else? OK, do you have your focus and reason for opening a Facebook Fan Page? Fabulous. Let's get one opened right now. Sign up for your Facebook Fan page here. You will also locate this same information on the bottom of the Facebook home page-right where it says "Create a Page for a celebrity, band or business." First choose a category. You can elect to only have a local organization. This is good for a school, church or brick-and-mortar shop. However, most of you will want to select "brand, product or organization." Once you do, there will be a drop-down menu that allows you to choose your specific category. The next part asks for "Name of Products." This is one of the most important parts you will be filling out. Although it's not explained on this page, whatever you choose for this box will affect your SEO, as it becomes part of the URL structure of your page. It is also included in the Meta data for the title tag. There's a big difference between naming your Facebook Fan page "Johns Fan Page" vs. "Grandma's Yarn, Needlepoint and Cross-Stitch." Finish filling in the legal stuff and hit "Create Page." You may be asked to fill out another security page, but at this point you have a Facebook Fan page—congrats! You are now on your way to having a powerful marketing tool. The first thing you want to do with your new Facebook Fan page is put up your branding/logo. Want to know a great trick to use for your logo? I will gladly share it with you in Part 2 of this article. In that segment, we'll continue setting up your Facebook Fan page and go down a list of business applications that can help promote your business.